Since it’s all about the love, I am making something yummy that completely compliments our Valentine’s Day table spread. 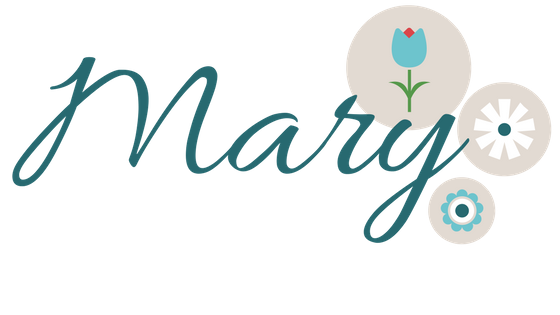 This year Valentine’s Day falls during the week, so I wanted to make something that would be rather simple and ready to go after school and work, but it needs to be special too! This recipe is so delicious and quick to make that you’ll want it during many other times of the year. 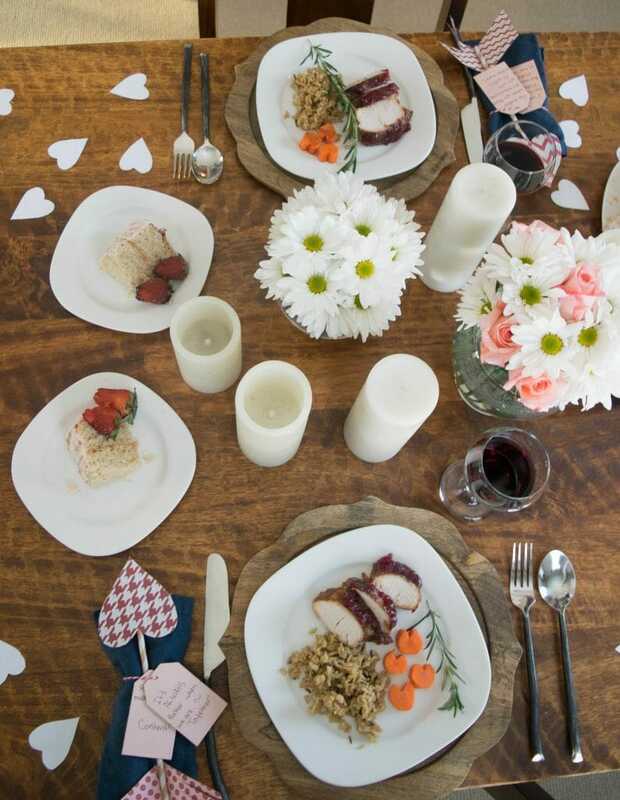 Slow cooker Glazed Cranberry Turkey Tenderloin recipe incorporates a wonderful cranberry glaze that adds a sweet flavor to the turkey and looks so pretty on our Valentine’s inspired table. Of course red is a great color for Valentine’s Day, so cranberries came to mind when I was trying to think of something special to make for a mid-week Valentine menu. I had to consider what type of meat might work with these fabulous little berries and turkey came to mind. There’s nothing terribly complicated about this recipe, but I do love the color and flavor that it presents, and the best part is it’s a convenient go-to for a special date night in. This week I will be sharing the dessert for this Valentines day dinner for two and Emily will also be sharing the cute tablescape she made and the thoughtful crafts to make this date night in happen. This is the first Our house now a home collaboration with my cooking and Emily’s decorating. It was a lot of fun! Add 1 Tbsp of olive oil to a skillet, heat the skillet on medium heat and cook the tenderloin for about one minute on each side. You can always make your own cranberry sauce, which I love to do, but for the sake of time and convenience, I used the canned variety. 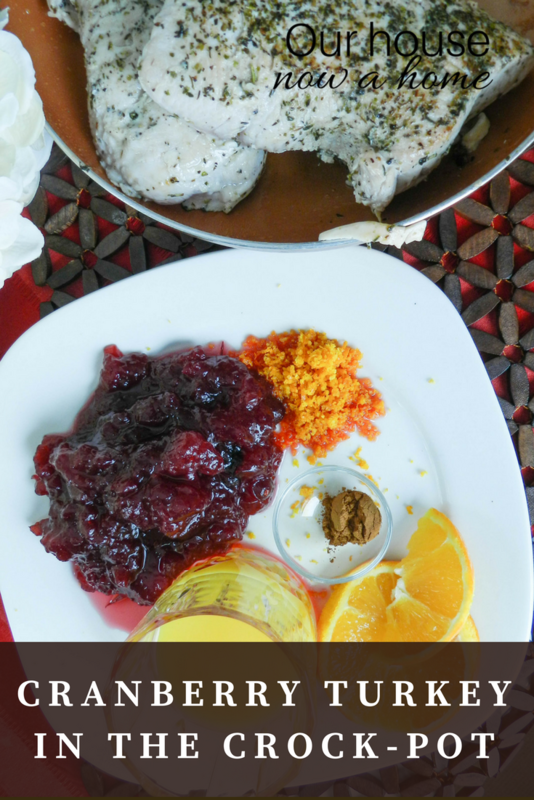 Mix 3/4 of the cranberry sauce, orange juice, cinnamon and orange zest in a small bowl until well combined. You’ll be reserving the remaining cranberry sauce for serving time. Put tenderloin in the Crock-pot after browning all sides. Pour cranberry mixture over the top of tenderloin. Cover and cook on high for 4 hours or on low for 8 hours, until meat is thoroughly cooked through. Remove and place on a platter. Top with remaining cranberry sauce for a beautiful presentation. So I wanted something fun to go along with this recipe and decided to make rice and a veggie. The big question now; how can I make a vegetable into something romantic? Artichoke hearts? Too obvious…Sweet potatoes? Not this time…Heart shaped carrots? Okay! Let’s do that. It’s really easy and you can add them to the Crock-pot if you want to or sauté with butter for a quick 10 minutes. I got these little guys ready the night before. No problem. Just take a nice big carrot, cut a V-shaped wedge into the top and use a vegetable peeler to smooth and shape your heart. The effect is just so cute. Add a little wild rice and we are ready to go. A really tasty way to make a fast Crock-pot meal. Cranberry is just the right ingredient to turn this into something special. Pat turkey dry with paper towels, season with Italian seasoning and pepper and brown the meat in a skillet. Put tenderloin in the Crock-pot after browning all sides. Mix 3/4 of the cranberry sauce, orange juice, cinnamon and orange zest in a small bowl until well combined. You'll be reserving the remaining cranberry sauce for serving time. Pour cranberry mixture over the top of tenderloin. Cover and cook on high for 4 hours or on low for 8 hours, until meat is thoroughly cooked through. Remove and place on a platter. Top with remaining cranberry sauce for a beautiful presentation. 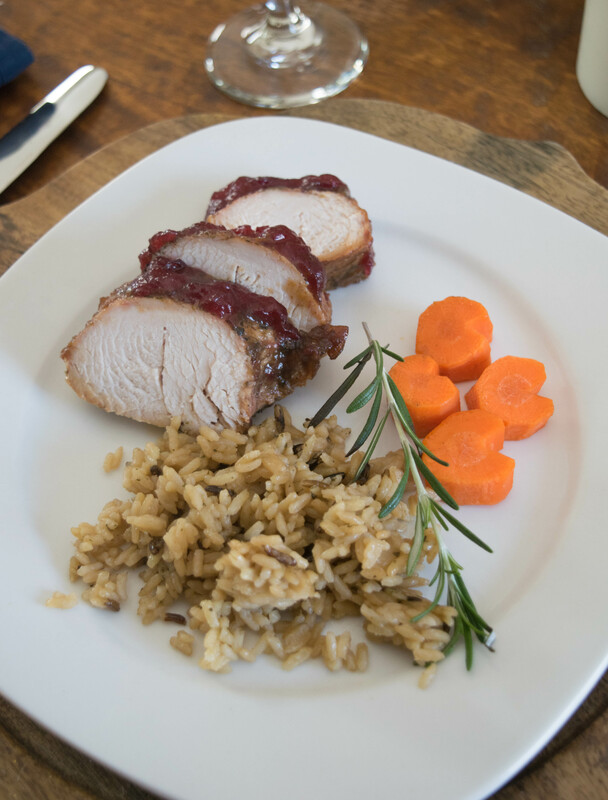 I hope that you enjoy this Slow cooker Glazed Cranberry Turkey Tenderloin recipe and have a fabulous Valentine’s Day. Enjoy time with your loved ones! 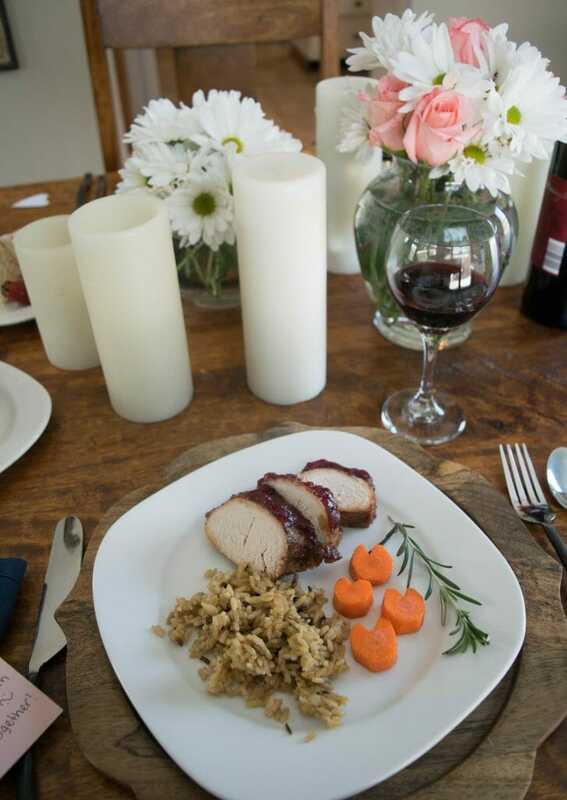 The turkey and cranberry sauce looks delicious and remind of the Thanksgiving. Love the rice as a side dish. I’m not cutting the carrots into heart shape, just cutting carrots. My husband loves cranberry sauce on everything, so I need to learn your recipe very quickly. This does sound easy! I don’t think I’ve ever bought turkey tenderloin. Do they come rolled horizontally ? I noticed your slices were circular 🙂 I found the heart shaped carrots to be a nice touch ! 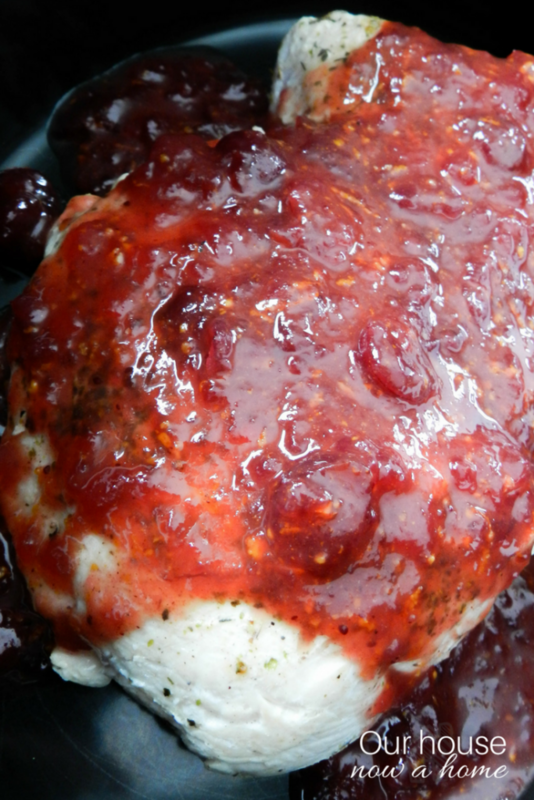 Turkey and cranberry sauce go perfectly together. 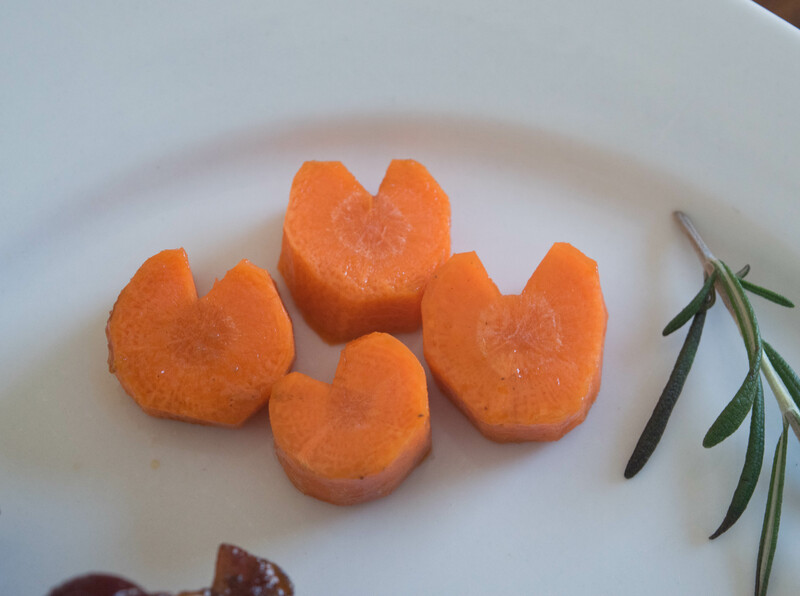 I love that you cut the carrots into hearts, they look totally adorable. WOW! That sounds like a wonderful meal! I am sure my whole family would LOVE this, so I am looking forward to making it for them soon. Yum, this would be a tasty dish for Valentine’s Day. I’ll have to share this with my husband and see if he’ll make it. We’ll probably just be ordering a pizza though. But I’ll save this to many another time for dinner! That looks and sounds amazing to me. This would be a very good meal for Valentine’s Day. I love the idea of cooking a home cooked meal for Valentine’s Day instead of going out. I think this is a lovely dinner recipe. I like the idea of going on a date night on Valentine’s day but there’s also too many people out. 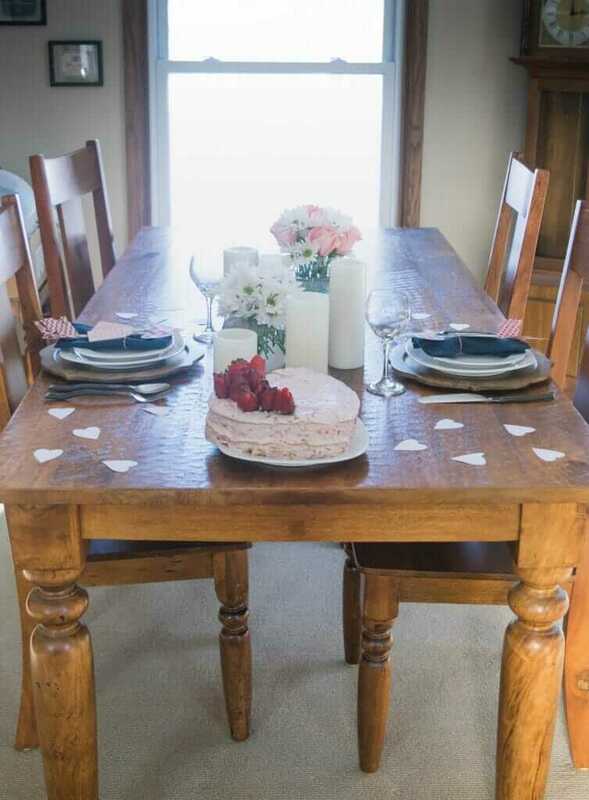 It’s better to enjoy a quiet dinner for two with some home cooked food. I love the whole plate! Those heart carrots, though. Too cute for words. I bet that turkey makes a great second day sandwich! 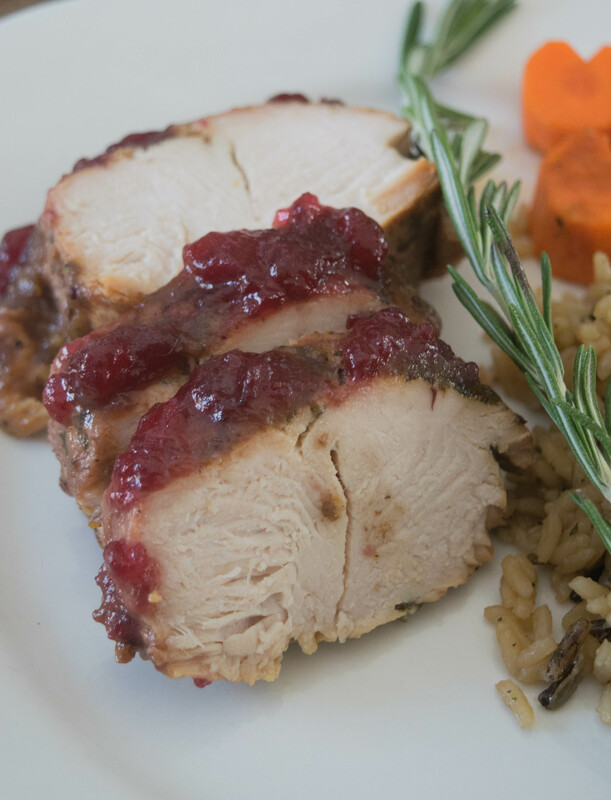 Wow, that Glazed Cranberry Turkey Tenderloin looks AMAZING! What a fun recipe for Valentine’s Day, or any day really. I love hoe the carrots are cut into a heart shape, how cute. Yum! This is our kind of dish. I love that this has Thanksgiving flavors. Slow cooker foods are the best. I like the ability to make it and forget it. This turkey recipes sounds tasty too, I need to try it out. That looks delicious, and I can’t believe you can make that in a slow cooker! I especially love those adorable heart-shaped carrots. Something else to give thanks for on Thanksgiving! 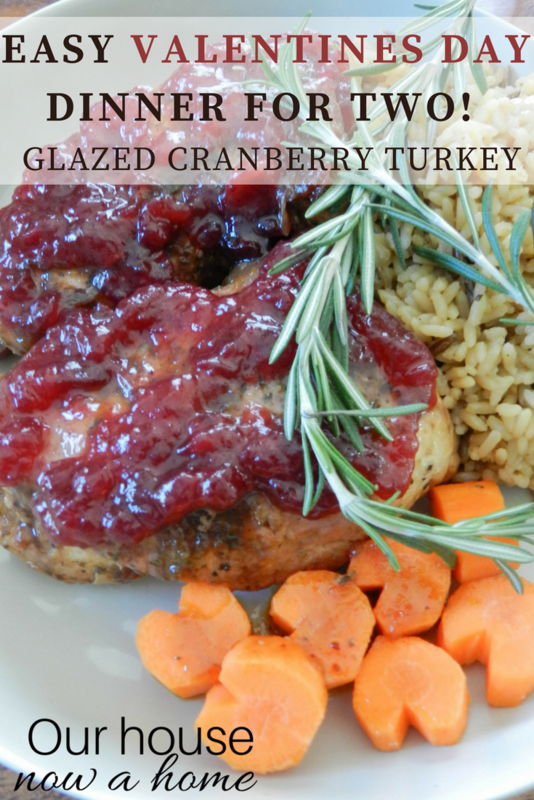 That looks like a wonderful dinner for Valentine’s day, although I still am a little turkeyed out from Thanksgiving I think this glaze would work well on pork chops or chicken too! This looks wonderful! I think it would be a hit in my home. I love the heart shaped carrots! Oh my goodness how delicious does this look! Absolutely perfect for a Valentine’s dinner and I love that it is slow cooked as it means you can put it in and forget about it while you spend time with your other half. I hadn’t ever thought about turkey and cranberry outside of Thankgiving, but it works 🙂 I can see it! I love the little heart carrots, too. What a tasty dinner for Valentine’s Day. 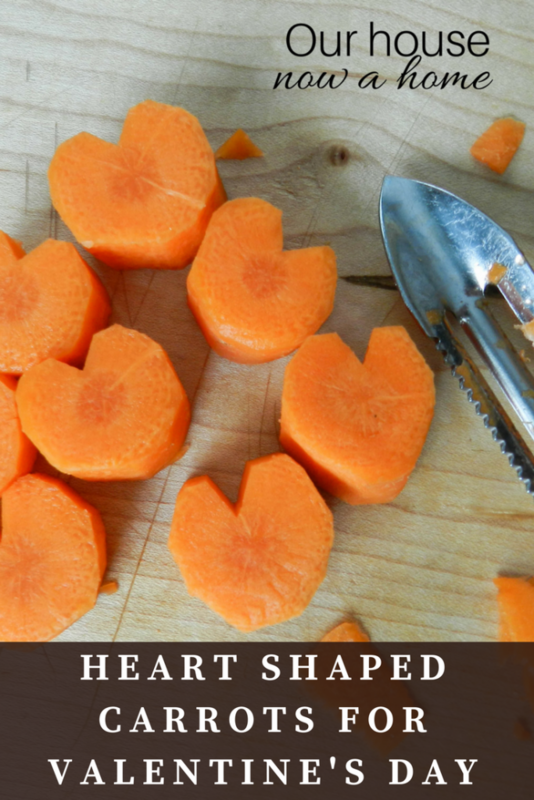 The heart shaped carrots are a really cute touch for a special meal. This is a great meal for two! It’s beautiful and I’m sure it tasted great. Ohh this would be just right in menu for Valentines day! I love the idea of making the carrots a heart shape one too. I guess we just really need to be creative. Now I have something to prepare that is a little different from what I cook. Lately I’ve been using my crock pot a lot lately. Must try this recipe! Valentines Day is, of course, the time to have that special dinner for just the two. The food need not be grand, it can be simple and made with lots of love. I am taking a cue from you and incorporating the heart shaped carrots this year. Looks amazing! My son and daughter love Turkey! This recipe would be perfect for Valentine’s day!